The practice field is the "upper" field which is shown above the Dog Park. 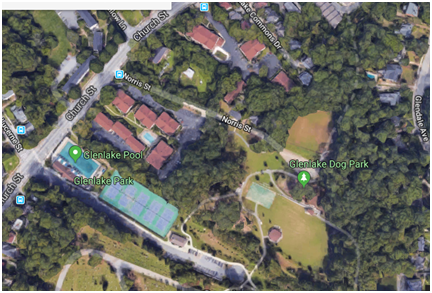 The main entrance into Glenlake is near the pool which leads to the paved parking lot you see in the park. There is also a gravel entrance listed as Norris Street on the map. This leads directly to the field and there is parking there. If using Norris Street, please do not use the adjacent condo driveways to access the gravel parking or park in the condo parking lot.